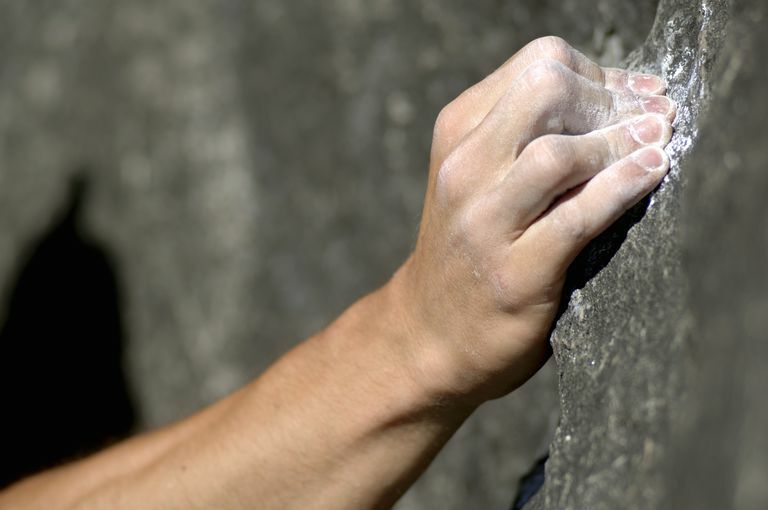 Finger injuries are common in rock climbing, which makes sense given the stress this activity places on the digits while maneuvering along uneven surfaces and supporting the weight of your entire body. However, the injuries that occur can be a little unusual, not just sprains of the finger or dislocations of the joints. One of the more unusual injuries that occur, and is seen almost exclusively in rock climbers, is called a rupture of the digital pulley. The reason this occurs is a result of the mechanics of the finger tendons and joints and the particular position the fingers are held in while rock climbing. The one other sports activity that this injury has been described in is with elite baseball pitchers. The forces acting on the finger are obviously very different with these two activities, but they both place high stress on the finger pulleys. Everyone has structures in their fingers called digital pulleys (doctors often use the words "digit" and "finger" interchangeably). These digital pulleys are specialized structures that hold the tendons against the bones of the fingers. Without these pulleys in the fingers, a problem called bowstringing of the tendons would occur. Tendons are structures that connect muscles to bones. When a muscle contracts, it pulls the tendon, which in turn pulls the bone. In the upper extremity, the muscles of the forearm contract, pulling the flexor tendons of the fingers, causing the fingers to contract into a fist. Without the pulleys in place holding the tendons against the bone, the tendons would pull tight across the palm, not allowing us to form a fist. This function is similar to a pulley function of a crane lifting a heavy object. Each finger has eight pulleys, but only two of them are generally felt to be of critical importance to prevent bowstringing of the finger tendons. When a person ruptures a pulley, they may sustain a variety of injury patterns from a simple strain of the pulley to ruptures of multiple pulleys in a single digit. In the most severe situations, when the tendons are bowstringing, the tendon may lift away from the finger when making a fist. It is important to have suspected digital pulley injuries examined by a specialist sometime soon (within several days to a week) after the injury. While emergency treatment is generally not needed, delayed treatment (weeks or months later) can lead to less successful results. The most important aspect of the clinical evaluation is to determine if there is any bowstringing of the tendons as a result of the pulley injury. If not, treatment is usually just simple protection until swelling and pain have subsided. Most commonly, the middle or index digit is the injured finger. The two critical pulleys in the finger are designated the A2 and the A4 pulleys. In rock climbers, either or both of those pulleys may be injured. Typically in baseball pitchers, the injury is isolated to the A4 pulley. Special imaging tests may be performed to both help with the diagnosis and to plan for treatment. An x-ray can be helpful to exclude other causes of finger pain including sprains and fractures of the finger. An MRI test is also useful, especially if the location or severity of the injury is not clear. Sometimes an MRI will be performed with the finger held straight, and then bent, to see if there is bowstringing of the tendons. If there is bowstringing of the tendons, then more careful management of the injury needs to occur. This does not always mean surgery is necessary, but there are specialized splints and therapy techniques that can allow the pulleys to heal properly. Only in situations where there are multiple pulley ruptures or if there is delayed treatment should surgery be necessary. As far as returning to activity, this varies significantly with the severity of the injury. With mild pulley strains, the full activity can be resumed as soon as swelling and pain have subsided. For full ruptures that are being treated non-surgically, duration of treatment is typically between one and three months. For people who require surgical reconstruction of a pulley injury, there may be restrictions for up to a year from the time of surgery. Goldfarb CA, Puri SK, Carlson MG "Diagnosis, Treatment, and Return to Play for Four Common Sports Injuries of the Hand and Wrist" J Am Acad Orthop Surg. 2016 Dec;24(12):853-862.